Electric tankless water heaters are considered the most inexpensive alternative for homeowners who are considering furnishing their home systems. Just like gas-powered units, electricity-powered units let you enjoy an unlimited supply of hot water while at the same time, lower your energy bills. In this article, we have come up with a list of the best electric tankless water heaters, including a summary of their best features, pros, and cons. We will also have a detailed discussion on this very intriguing topic: is electric better than gas? Keep reading if you want to learn more on the electric tankless water heater that is right for you. In this section, we are going to discuss the top three choices for the best electric tankless water heaters. You might want to review the key features, pros, and cons carefully, so you can further narrow down your choices. To summarize what you can expect in the products presented in the reviews, refer to the table below. 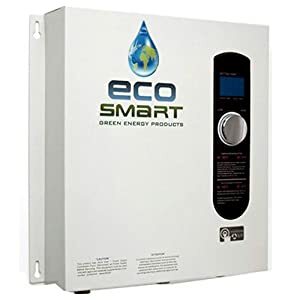 The EcoSmart ECO 27 electric tankless water heater is one of the largest ones available in the market right now, with the brand’s patented self-modulating technology. This water heater is ideal especially in northern United States, where water temperatures can go as low as 37°F. The ECO 27 unit has the capability to heat at least 3 gallons in a minute. To add, it can be able to accommodate up to two showers running at the same time while never running out of water. For homeowners in southern United States, on the other hand, the ECO 27 will be able to handle a high demand for hot water in multiple applications, as it has the capability to heat 6 gallons in a minute. With this in mind, it is like running 4 showers at the same time and still will not run of out hot water. Another great feature of the ECO 27 is the digital temperature control where you can set the desired temperature anywhere from 80°F up to 140°F. As long as you size it properly, your electric tankless water heater will be able to provide you unlimited on demand hot water. If you are not yet familiar with how it works, it has the ability to heat water as it passes through the unit, which is very much different from storing how water just like in a tank type water heater. Having the ECO 27 would also mean that you can save as much as 50% on water heating costs, as you only need to turn the unit on when you need hot water. Unlike traditional tank type water heaters, electric tankless water heaters are wall-mounted, which can definitely save you some space in the bathroom. In addition, with EcoSmart’s most advanced self-modulating technology, the unit would only be using the amount of energy it needs. You can also be assured of the unit’s efficiency, easy replacement, as well as its durability because of its copper and stainless components. It uses 3 9KW standard Emerson electric heating elements that come with brass tops for electrolysis prevention. It is also equipped with a copper heat exchanger, along with the automatic resettable thermostat. It should be noted, however, that there is a need to check your household’s water and electrical requirements prior to purchase and installation. Electrical requirements include 27KW, 240 volts, 112.5 maximum AMP, and three sets of 8 AWG. Lastly, if what you are looking for is peace of mind after you have purchased the ECO 27, the brand is offering a limited lifetime warranty on electronics, exchanger, and element. You may bring the unit to authorized service centers if you need to have it repaired. It should be noted that labor is not covered by the warranty, and the customer always shoulders that cost. With its demonstrated efficiency and durability to its limited lifetime warranty, this is an electric tankless water heater that you might want to consider if you want a unit that can deliver superior reliability and functionality. 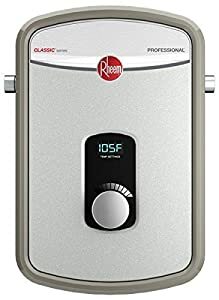 The Rheem RTEX-13 Electric Tankless Water Heater is no doubt, one of the most popular units right now. If you are unaware, it is the upgraded version of the Rheem RTEX-9. While the RTEX-13 is as rugged, efficient, and space saving as its predecessor, it now has the sophisticated incorporation of the digital thermostat that comes with user-friendly controls. If you are living alone, this might be the product you might want to consider buying. It should be able to work perfectly for one-bathroom apartments, wherein shower times are spread out in the entire day. The Rheem RTEX-13 has a maximum flow rate of 4 GPM, which is already considered a win given its price. This rate is ideal especially for one-shower-at-a-time household. It can also be ideal for homes wherein dual showers are equipped with 1.5 GPM flow rates. It can fit into the tightest spaces, even in a kitchen cabinet or a small cupboard. With its ultra-compact size, it can be installed anywhere, which can mostly be beneficial for those who live in small apartments. This unit is also the cheapest of three products included in this review, and at the same time, cheap when it comes to energy savings. While the predecessor did not live up to this one’s reputation for outstanding reliability and build quality, the RTEX-13 does. You should also be aware that this unit has not been out in the market for too long but reviews regarding its performance have been great as of writing. If you are worried about the energy consumption when using this unit, it is actually a relief that it is 99.8% energy-efficient. It can draw up to 54 amps of power, which might be a little bit high for some. In order to prevent future problems in your household’s electrical system, you might want to make sure that there is a 60-amp breaker box that will be able to accommodate the power requirements of this electric tankless water heater. In addition, the brand is offering a three-year warranty on parts. With regards to the unit delivering superior performance, you might find peace of mind knowing that this unit is made in Germany. If you are looking for a cheap electric tankless water heater that you will use in a single bathroom, you might want to consider choosing this product. Engineered and constructed in Germany, the Stiebel Eltron Tempra Plus 29KW Tankless Electric Water Heater features an innovative design and topnotch build quality. It is one of the most efficient and precise machines but a well worth product in the long term given its price. Unlike the previously discussed unit, this one is ideal for use on a larger household, probably with two to three bathrooms. One of the best features of the Stiebel Eltron Tempra Plus 29KW Tankless Electric Water Heater is that is has a very smart design. It will be able to automatically adjust its settings according to the amount of power required while using only little energy. When it is being used by more than one bathroom, it also has the ability to adjust the water flow, thus aids in making sure that it can heat water even in the places with the lowest temperatures. It is also interesting to know that a lot of buyers were very satisfied with this product because of its constancy, regardless of the amount of appliances that are running simultaneously. You might notice that some of the other water heaters have a drop in terms of output whenever another source requires hot water has been turned on. 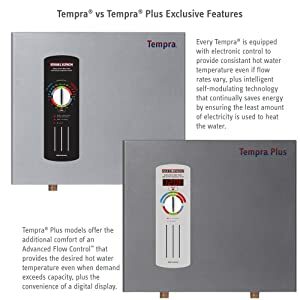 This would be a totally different story with the Tempra Plus water heater, as the unit can automatically adjust in real time through lowering the water pressure. This feature can also prevent uncomfortable temperature fluctuations, especially when you are in the shower. Its system is effective, which is reflective of the brand not listing a maximum flow rate. This is an advantage for high-usage applications, wherein you do not need to ration hot water usage. Installation is a lot cheaper and easier with the Stiebel Eltron Tempra plus 29KW Tankless Electric Water Heater, as it will not be necessary to vent a tempra outside. It also features a digital display, along with an easy to use dial selector that lets you set your desired output water temperature from 86°F up to 125°F. A downside, however, is that it is very expensive. It is priced close to a number of gas-powered water heaters, but it is undeniably a lot more powerful. Another thing, some of the product’s buyers were unimpressed with the unit’s automatic management system, saying that the unit does not really perform well in the cold. For its specifications, voltage is set at 208/240, wattage at 21.6 and 28.8 and amperage is at 3×35 and 3×40 min. Prior to purchase, check your household’s electrical requirements. Lastly, the brand is offering a 3-year warranty on parts, which reflects the product’s trouble-free performance. Should You Buy An Electric Or Gas Tankless Water Heater? In this section, we are now going to talk about the comparisons between gas tankless water heaters and electric tankless water heaters. Through the criteria presented below, we will go deeper into determining which one of the two is better. Initial Cost: The price is of the most important factor that you need to consider when choosing a water heater. If you are on a tight budget, an electric tankless water heater might be the one for you. Did you know that electricity-run water heaters are normally cheaper than gas-fueled ones? While electric models are generally priced below $500, gas water heaters, on the other hand, can be priced as much as $1,000. Operating Cost: The long-term cost is also an important factor because both models differ a lot. While gas water heaters are more expensive, they are way cheaper in the long run. However, this does not necessarily mean that gas is better. You should also be aware that electric water heaters have a 98% efficiency rating while gas water heaters only have 85% efficiency rating. On average, using gas tankless water heater can make you pay 15% more when it comes to long-term expenses. It should be noted as well that factors such as your extent of use and location are also important things to consider when evaluating the operating cost. Installation: Electric tankless water heaters are generally easier to install than gas tankless water heaters. Instructions on its assembly are more straightforward compared to gas water heaters. For gas, installation can be a little more complex and complicated, as factors including venting and combustion air supply should be taken into account as well. In addition, installing a gas water heater would also mean that a lot of modifications are still required. Even if you are in search of a water heater that is easier to assemble and install, you should never forget to seek professional help. The reason is that you may void the warranty if you damage the product upon installation. You should also be aware that manufacturers have a way of telling if someone who is authorized or someone who is not caused the damage to the unit. Maintenance: As you may already know, a well-maintained tankless water heater will deliver an outstanding performance. Between electric and gas, electric might be a better choice because it does not require too much on your end when it comes to maintaining it. In most cases, all that you have to do is to clean the water inlet occasionally. Gas water heaters, on the other hand, are a lot more complicated when it comes to maintenance. Not only does it require an annual inspection of the unit but it also requires a professional to do so. This would ultimately mean that the inspection would cost you money. The annual inspection is for your assurance that there is safe combustion of fuel, thus decreasing the possibility of it being a fire risk. In addition, regular flushing is mandatory in order to make it less prone to mineral deposits. Service Life: In order to determine which one to buy between the two, you should be able to answer this very question: Which between the electric tankless water heater and the gas tankless water heater will last longer? It actually is a relief that both units can go as far as 20 years. However, as discussed above, electric tankless water heaters are easier to maintain and is undeniably less prone to wear and tear. This should conclude that electric ones generally last a little longer than gas ones. To add, electric waster heaters are easier to troubleshoot, which can also be regarded as a factor why it is longer lasting than gas tankless water heaters. It is also important to note that factors such as maintenance will definitely have an impact when it comes to the service life of the water heater. You should also be aware that if you are dealing with hard and acidic water, the water heater tends to be more prone to damages. As discussed above, installation should always be done by a professional, whether it is for an electric tankless water heater or gas tankless water heater, as improper and incorrect installation can absolutely shorten its lifespan. Size and Performance: If you will notice, electric tankless water heaters are more compact than gas tankless water heaters. Electric heaters can be installed even in the tightest spaces, such as the kitchen cabinet or cupboard while gas heaters cannot. When it comes to performance, you can also be assured that electric water heaters are better as the water is heated as it passes through the unit, unlike gas water heaters, in which you need to store the hot water. To add, electric water heaters provides you unlimited supply of hot water while gas water heaters do not. With the electric heater, you will not be worrying if the person who used the shower before you do used up all the hot water and left none for your use. This is mostly beneficial for large families, wherein you do not need to be concerned even if some of your family members take awful long showers. This is also the same when you are doing laundry, the electric water heater’s endless supply of hot water allows washing your load of laundry after load. Environment-Friendly: As mentioned in the reviews above, electric tankless water heaters only use energy when you need hot water, unlike gas tankless water heaters. Electric heaters use far less electricity and therefore, do not cause a lot of damage to the environment. In addition, modern models of electric tankless water heaters are constructed from recyclable materials, which would mean that there is less waste in the long term. With these factors to consider when choosing between the electric tankless water heater and the gas tankless water heater, it is apparent that electric ones are far better than gas ones. In terms of initial and operating cost, using electric is way cheaper in the long run compared to gas. Factors such as maintenance and installation are also easier with electric. In terms of service life, size, performance, and the environment, the electric tankless water heater is also a clear winner between the two. Probably, the most defining factor that really sets the electric above the gas is that it provides an unlimited supply of hot water. With these in mind, you should be able to conclude that electric is better than gas. Now that you have finished reading this article, I hope that you will now be able to decide which between the three is the best electric tankless water heater that is right for you. Even though I have provided you with the reviews, it is ultimately your decision to decide which one suits your needs. You should always take into account your preferences and needs, as they will be the deciding factors on which of the three you should purchase. You also just need to be able to evaluate the pros and cons effectively to come up with a better buying decision.